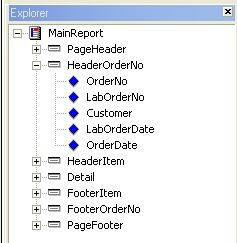 The Explorer Window, displayed from the Standard Toolbar, is a tool that lets us see what data field is being used in any given report section. Reports are apt to get busy with fields. You may be starting a report on a Monday and not get back to it until Thursday. Then, when you drag a field from the fields list onto the report, it shows up as the second or third copy of that field. Now, it's pretty unlikely that you really want that many copies of the same field on your report. You may not be able to spot that field in a report that contains multiple headers and footers. So we use this tool to discover where a field is being used. Here is an Explorer Window from the Sales Order History Report. You can open more that one section at a time.